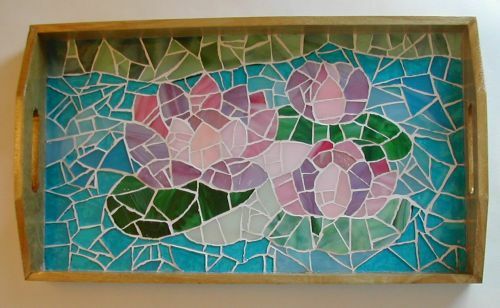 The glass mosaic trays are created on a wood tray base with indivually cut pieces of stained glass, glued to the wooden base, grouted and sealed. 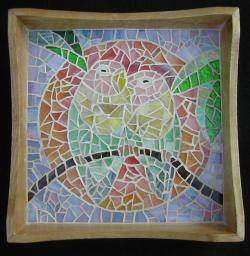 The wood is stained or painted with enamel paints. The trays can be easily cleaned with a damp cloth and Windex. There is a varition in size [from 6" x 6" to 14" x10" x 2.5"] and style of the wooden base [straight or scalloped edges] available. 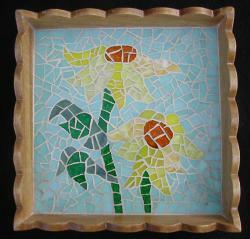 Patterns and colors can be customized. The larger trays are $45-$55 [based on size] + shipping/handling ranges from $14 to $20. The small trays are $29 + shipping/handling ranges from $12 to $16. 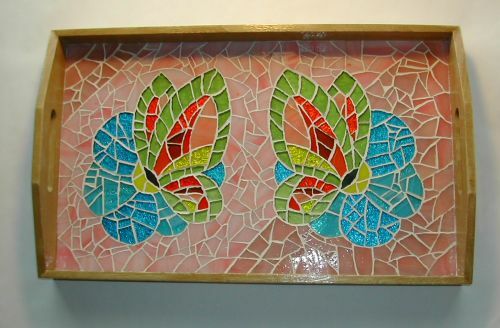 The tray, pictured to the right, was a special order made with the remaining pieces of the customer's broken pottery platter. The tray surface was covered with an epoxy coating.